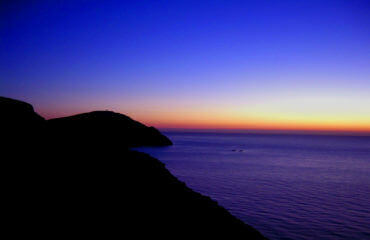 The Cabo De Gata marine national park based in the South-Eastern corner of Spain is Europe’s only true hot desert. 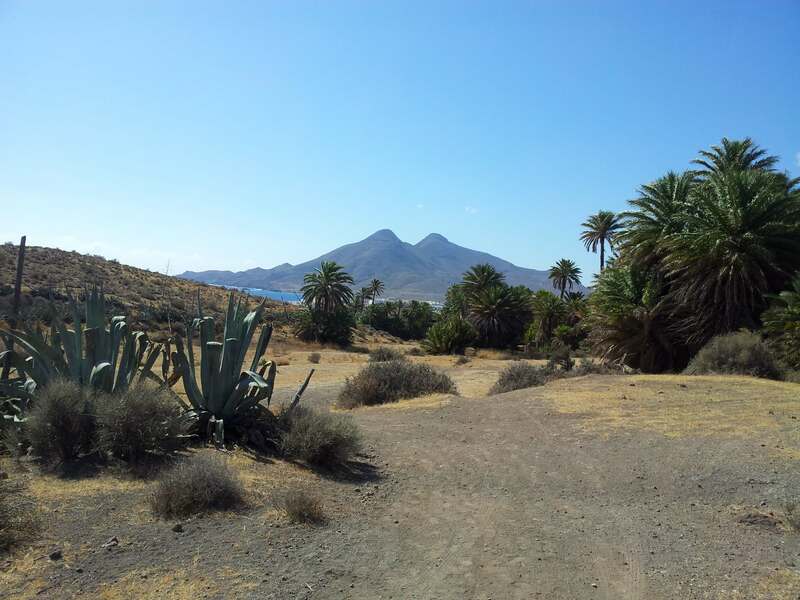 The mountain range of the Sierra del Cabo de Gata with its highest peak El Fraile is Spain’s largest volcanic rock formation. Falling steeply to the Mediterranean Sea creating 100-metre high cliffs. 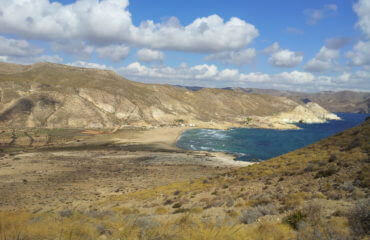 Some of the most beautiful beaches in Spain are found in this region as well as some stunning cliff top walking. Offshore are numerous tiny rocky islands and, underwater coral reefs teeming with marine life. 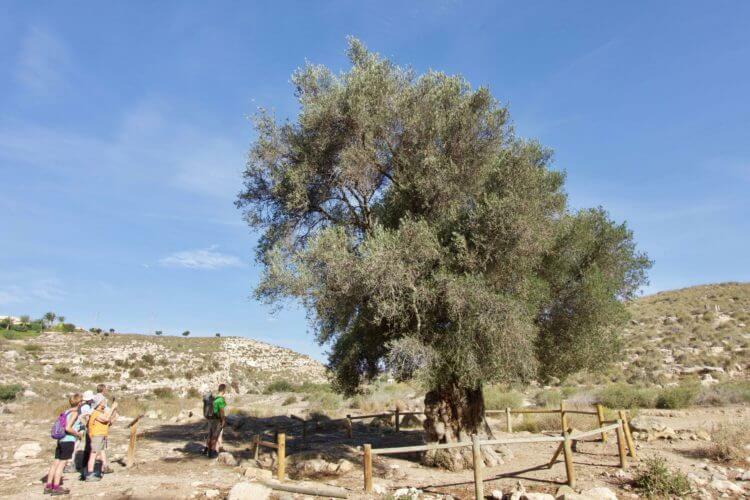 Its climate is arid to the extent of being the driest location in Europe and the continent´s only subtropical or “warm” desert, with rainfall below 200 mm a year and average yearly temperatures above 18 °C. In 1997 it was designated as a UNESCO Biosphere Reserve. 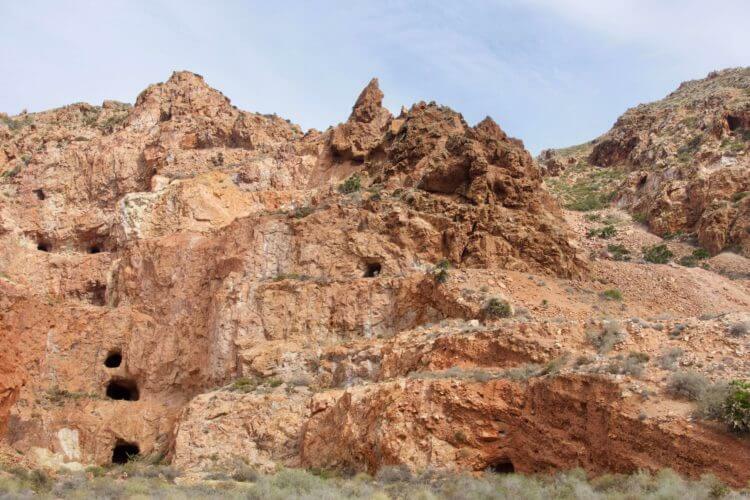 The name ‘Cabo de Gata relates to the mineral agate which used to be mined in this area. 1,100 species of fauna have been recorded within the park, the majority of which are birds. The European Union has designated a Special Protection Area for bird-life. 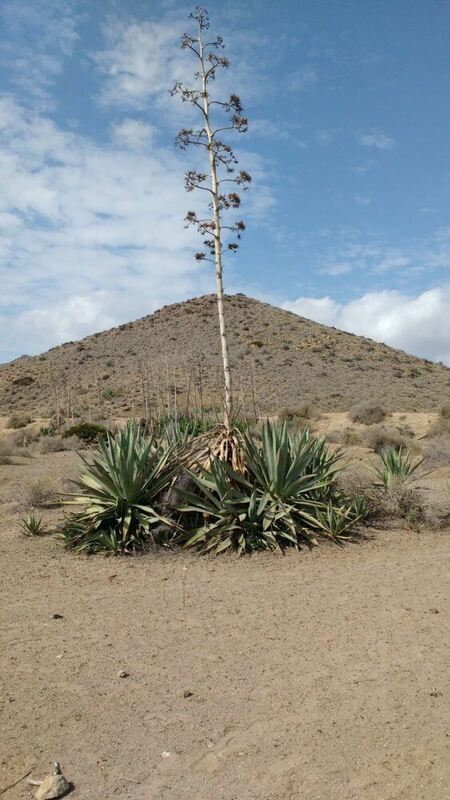 There are over 1,000 plants recorded in the reserve, some of which are endemic to the Parque Natural de Cabo de Gata and some of which have become symbols of the natural park. 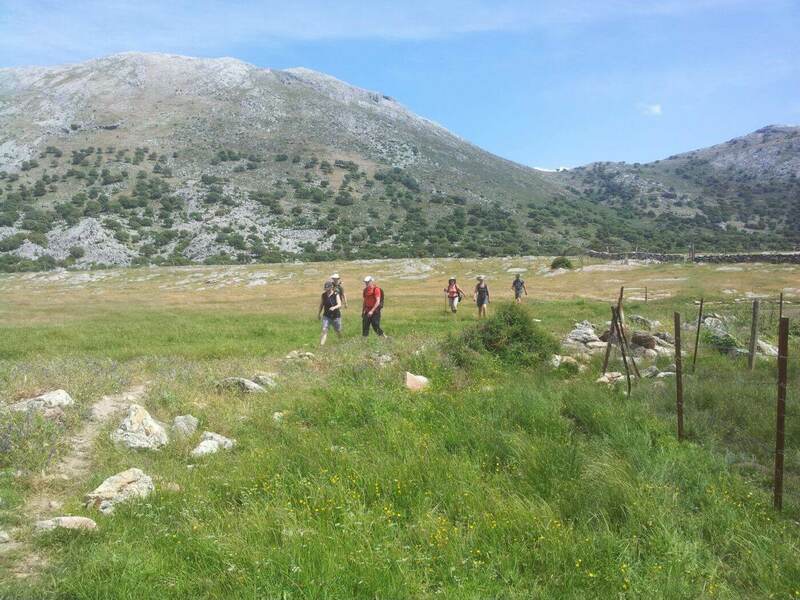 This guided walking holiday has been designed to walk along the Marine Natural Park with the chance to reach beaches that cannot be reached by vehicle and swim in the pristine waters. Some days guided walking along beautiful deserted beaches and cliff tops and some days walking into the interior of the region to get a feel for the arid landscape that so many novels and films have been set in. 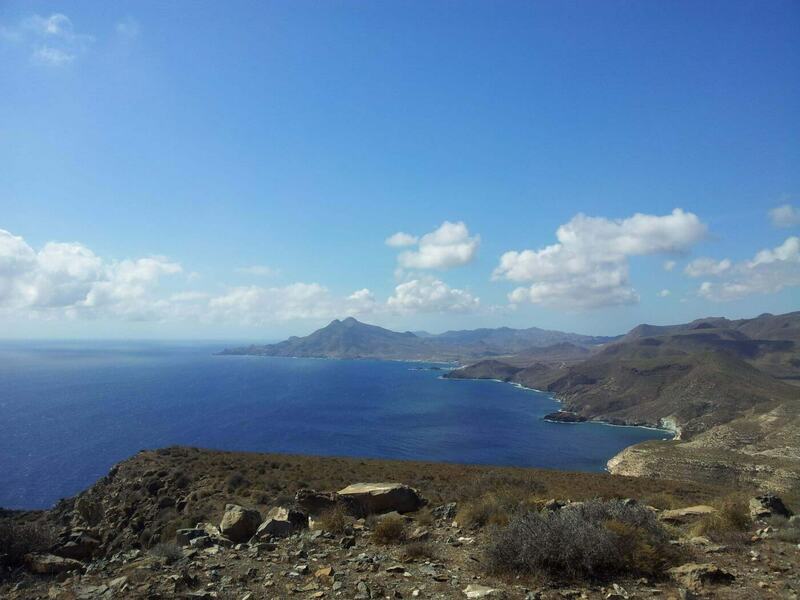 All about the Cabo De Gata – Guided Walking Holiday. 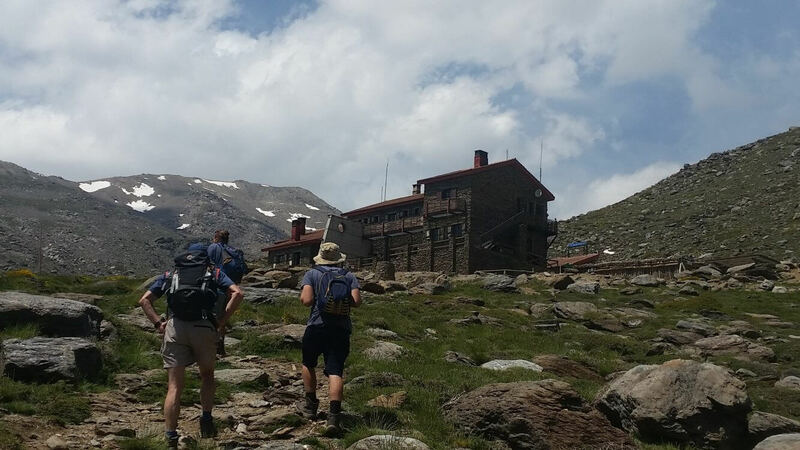 A leisurely autumn winter guided walking holiday. 7 nights staying in very good hotels with excellent food. 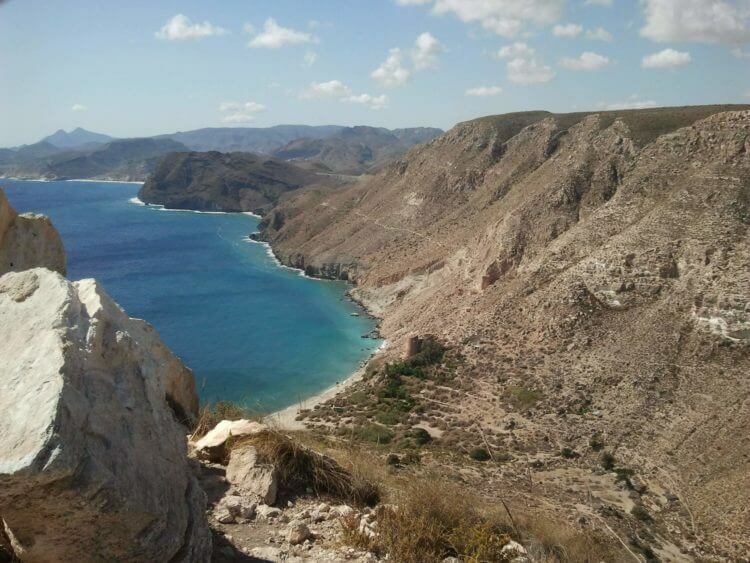 This hike takes us from Agua Amarga all the way to the south of San Jose a distance of 50km. 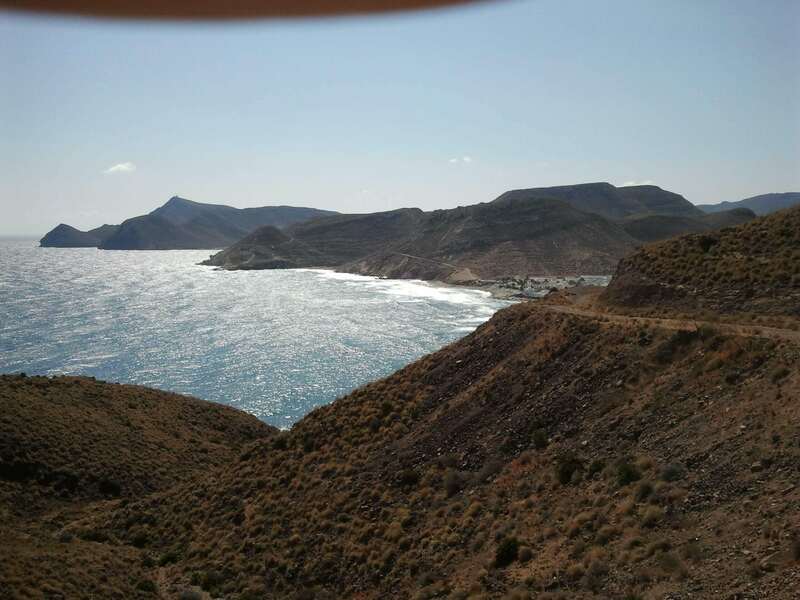 Walking along the beautiful Cabo de Gata marine national park coastline the views are endless, inland as well as along the coast. 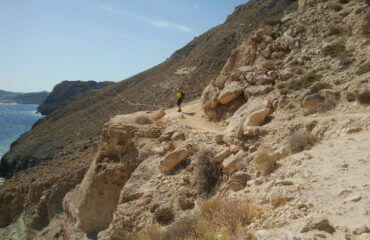 This is the only desert in Europe so the weather is dry and warm and perfect for walking in October to March. 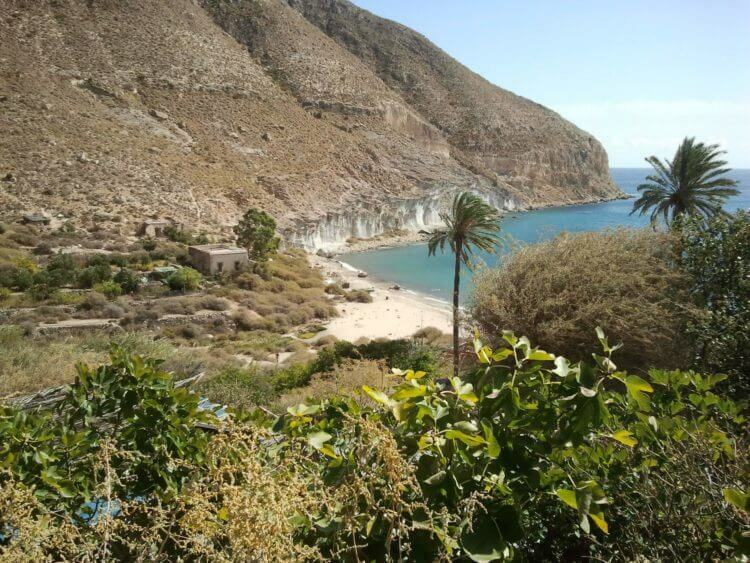 We start our walking holiday in Agua Amarga a small fishing village, where we spend 2 nights. 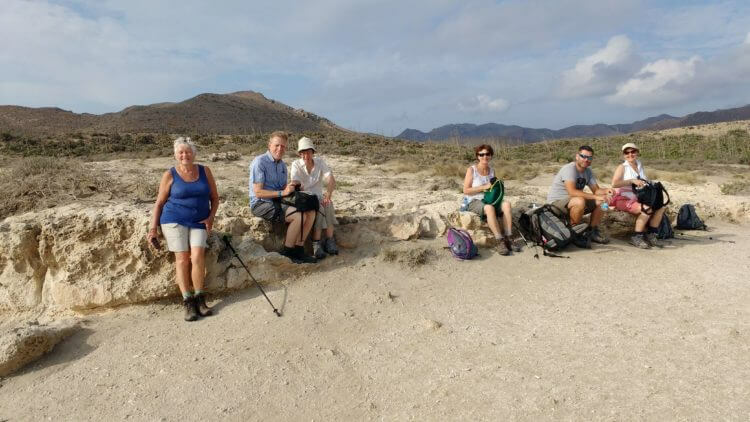 We walk the first day out into the surrounding countryside, walking out into the ancient volcanic landscape, through a peach orchard before following the old mining railtrack back to Agua Amarga. The next day we walk to the next hotel in Las Negras, following high above the mediterranean sea along the cliff tops, Lots of opportunity to bathe in the unspoilt coves along the way. 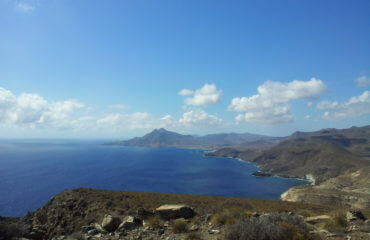 From Las Negras it is a beautiful walk to Rodalquilar via the lighthouse, perched high up over the sea. 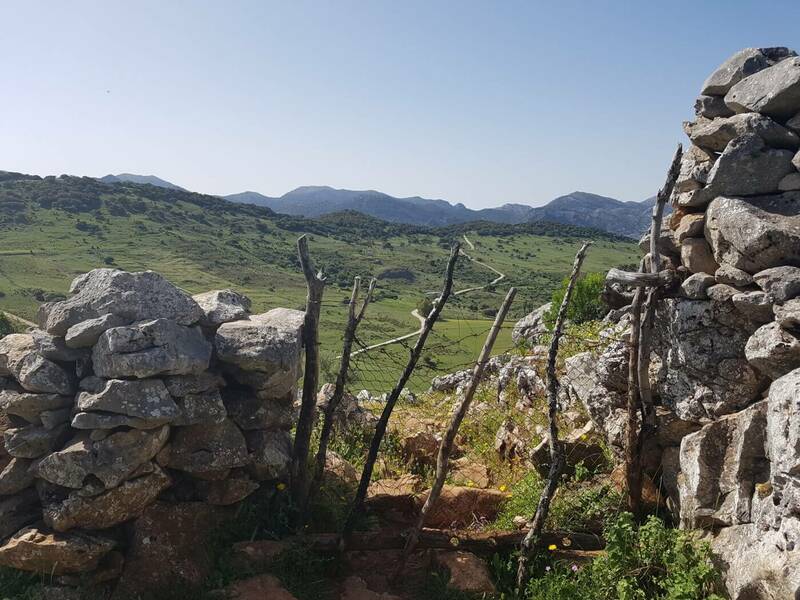 We spend 2 nights in Rodalquilar with an excellent walk inland to the now unused gold mines and getting views of the cortijo los frailes – the setting for Lorca’s play the blood wedding. We thenwalk from the hotel to San Jose, the biggest town in the area. 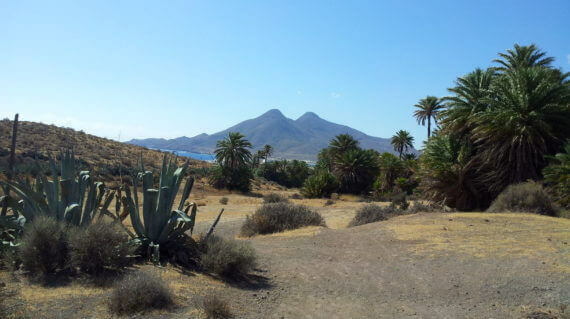 Walking along the coast through various small fishing villages and then pass the highest peak, Los Frailes. 2 nights is San Jose, with a short walk to the perfect beaches of Playa de Monsul and Genoveses, where you can spend a few hours swimming and enjoying the views. This week has some fabulous seafood to try as well as some fabulous moroccan tajines in the first hotel. Overall if want to walk, swim, snorkel, relax and eat well this week could be for you. 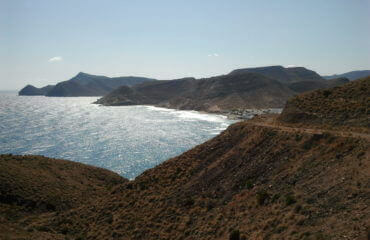 Meet at Almeria airport and leave for Agua Amarga at 14.00hrs. A great walk to introduce you to the area. 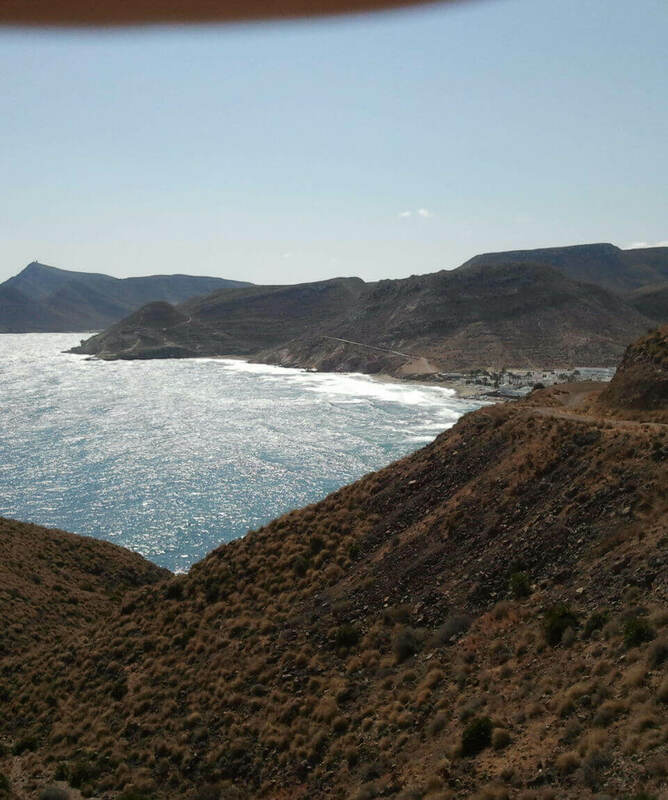 Walking from the hotel out into the surrounding countryside, through agricultural land and orchards before following the old train track back into Agua Amarga. 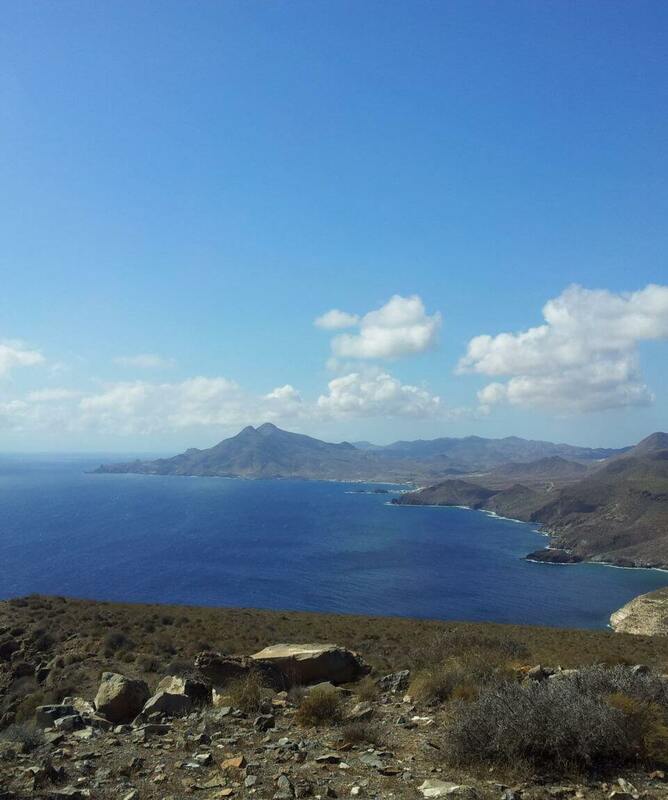 A scenic cliff-top walk takes you to a delightfully secluded cove, once a pirate stronghold, before we carry on to Las Negras. Don’t forget to take a towel with you on your walk, as there is always an opportunity for a quick dip! Walking along cliff tops and beaches before we take a diversion to Torre de Los Lobos – a stunning view point by a lighthouse and watchtower. Great views North and South. Check into Hotel de Naturaleza Rodalquilar. 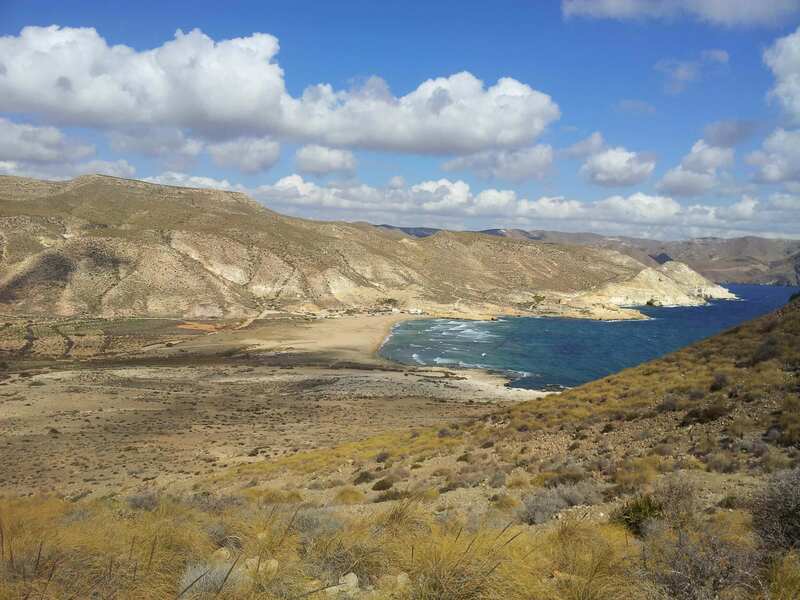 The route stays along the coast, passing some fine viewpoints; the picturesque Cala de los Toros cove; and the 18th-century fort of San Felipe. 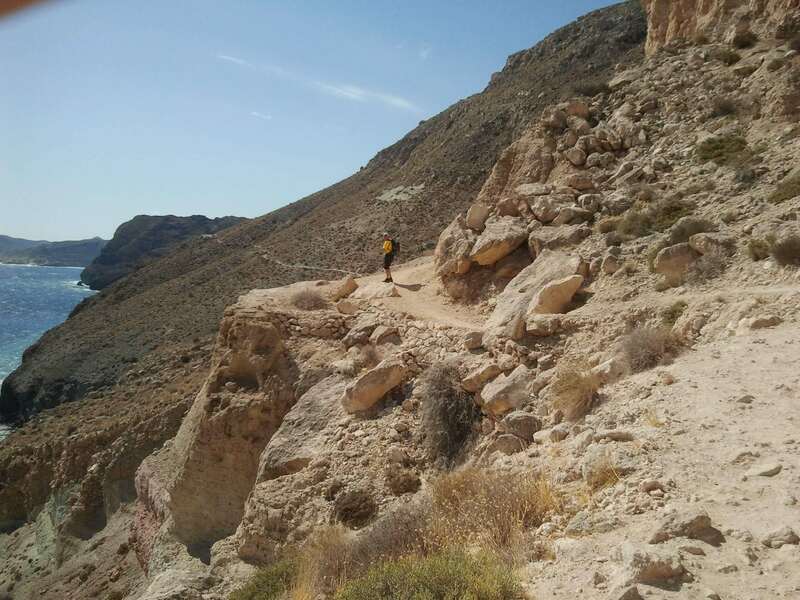 For the last part of the walk you follow a wide track that passes beneath El Fraile (493 metres), the highest peak in the Cabo de Gata Natural Park. 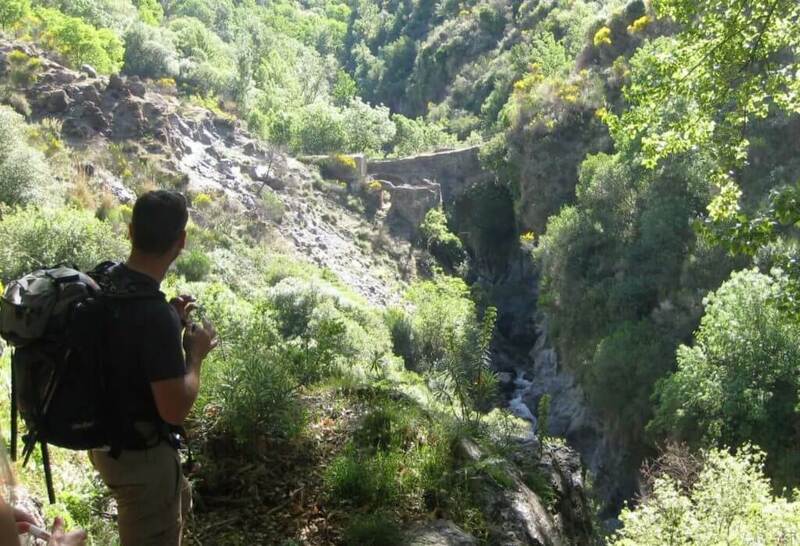 Your final walk starts by winding inland through a quiet cultivated valley before turning back towards the coast. You then walk back to San José via the beautiful beaches of Monsul and Los Genoveses. With its strange volcanic rock formations and massive, wind-rippled sand-dunes, the former was the setting of the film ’Lawrence of Arabia’. A beautiful hotel with pool. Large rooms and some excellent moroccan food. 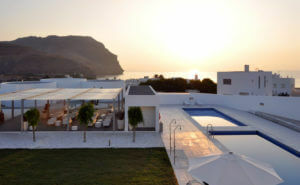 A beautiful hotel with large rooms all around a large swimming pool Wifi in bar/restaurant. Excellent restaurant. Large rooms with a swimming pool. Situated on the main street in San Jose. Very nice and clean. Wi-fi in rooms. What should I bring?How do we get to the Cabo de Gata?What insurance do I need?Can I come on my own?What is the maximum number in a group?Do you ever cancel weeks?Do I need to walk everyday?Do the hotels cater for my diet? 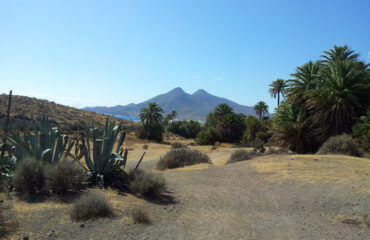 How do we get to the Cabo de Gata?